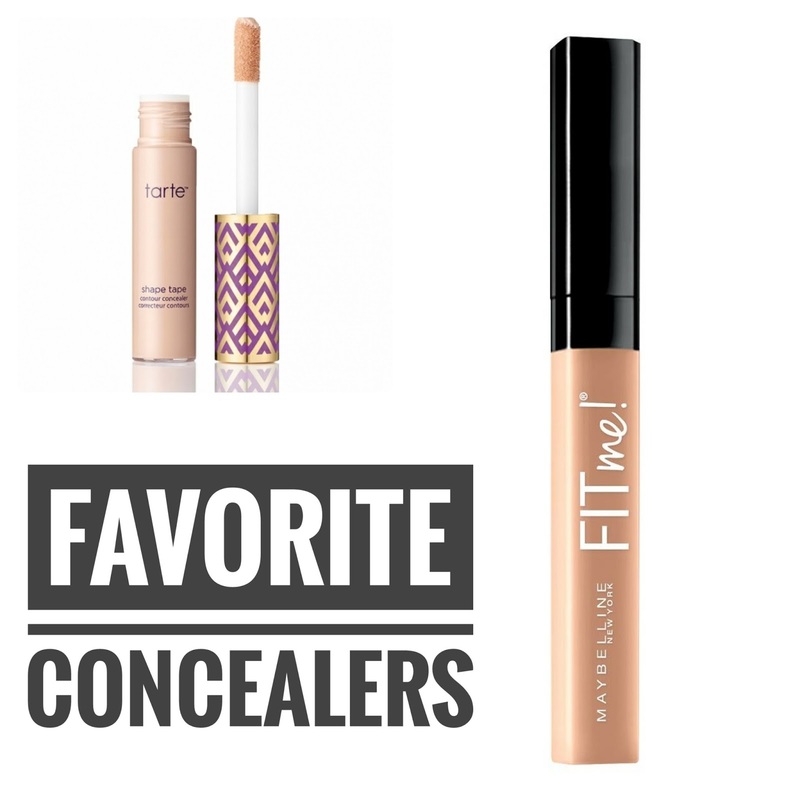 On Day 12 of my March Favorites, we'll be talking about my favorite concealers! This was a difficult choice, mainly on the drugstore side because there are a few that I reach for on a regular basis. But the two that I ended up choosing as my absolute favorites have a slight edge over the others for one reason or another. Before I discovered Shape Tape, I was using Benefit's Fake Up Concealer, which is very hydrating on my dry under eyes (I still use it sometimes). Most concealers tend to cake up on me and settle into fine lines, making me look older, but the super emollient formula of Fake Up doesn't do that. Then a few months ago, I kept hearing lots of hype about Shape Tape, so I tried it on my hand in-store at Ulta. It seemed way too drying so I ended up passing on it. Then a friend who has drier skin than I do told me it was her holy grail, and to trust her that it works just fine if you're dry. So I caved and ordered it and she was right! It covers just about everything and blends beautifully. I only use a little bit (for me, less is more when it comes to concealer) and it doesn't cake up or settle into my lines. It lasts all day and looks so smooth under my eyes with no creasing. The only downside is that it has a strange citronella scent (like those candles you burn in the summer to ward off mosquitos) which is kind of a weird thing to put on your face but after it dries I don't smell it anymore. With this one, the hype is definitely real...I would recommend this to just about anyone! For reference, I wear the Light Neutral shade (it's neither pink or yellow toned) and it goes on just slightly lighter than my natural skin tone. If I wanted to highlight, I would probably go with the Fair Neutral shade. As far as drugstore concealers go, this one is definitely my favorite because it offers slightly more coverage than the other ones I like, such as Maybelline's Age Rewind and Rimmel's Match Perfection. I reach for this one most days because it gives good medium coverage but still looks really natural (I tend to reserve the Tarte Shape Tape for days when I'll be going somewhere and wearing a full face of makeup). The formula is so creamy and smooth and it gives me a really fresh, flawless look with no caking or creasing. In fact, the beautiful satin finish is so nice, I sometimes end up dotting it all over and using it as a foundation! I wear it in the Fair shade, and it's slightly lighter than my natural skin tone. Available at Ulta and drugstores. The issue I have is shadows due to lack of volume in my undereye area (genetic). It makes me look like I have dark circles when I really don't. I've come to terms with not ever being able to make my undereyes appear brighter unless I get fillers. The only thing that comes even close to helping the problem is MAC Pro Longwear concealer. It's funny, everything you described struggling with is exactly how I would describe my undereyes and concealers. I've tried so many! And all the products you've listed here are exactly what works for me too. LOL Apparently you get into your later 30s and similarities emerge.